The smallest change can make the greatest difference when it comes to bringing a space together, but it’s difficult to know what’s required without the help of a well-trained eye. 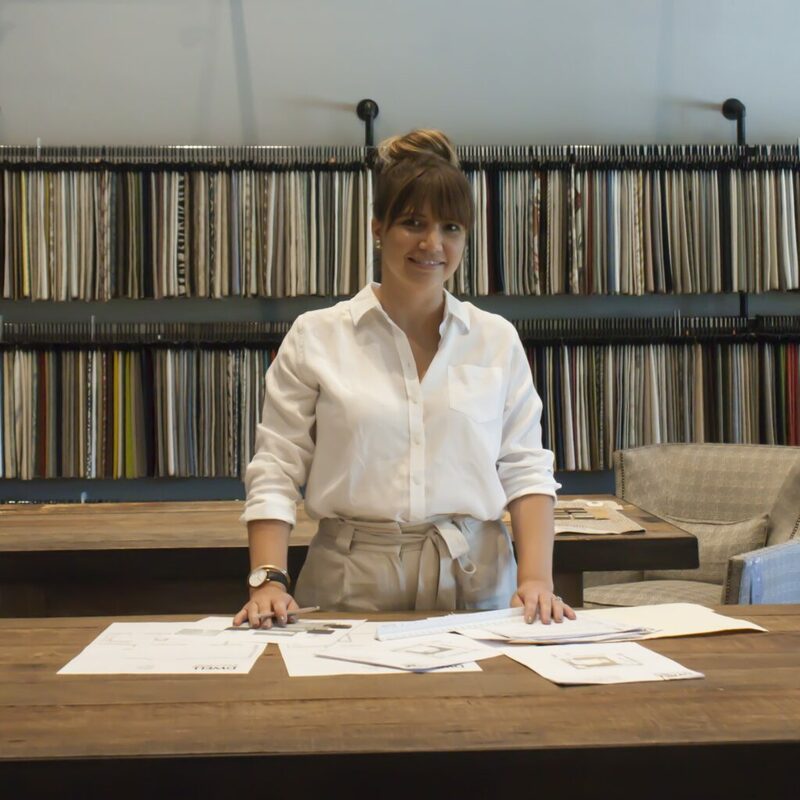 Krystal Loes is the Senior Designer and Design Studio Manager at Dwell. We asked her to tell us about herself and describe what she does every day to send her clients back to a beautiful home. My dad was a general contractor my whole life. As young as I could remember, I would go to the job site and checked things out. That’s when I started to have a lot of interest. Once I got older, he would build a lot of spec houses and would allow me to help out picking finishes, flooring, paint colors, so then in high school I did a couple job shadows with interior designers because I felt that I was debating architecture or interior design. After doing the job shadow I really felt like interior design was more the direction I wanted to focus on. For me, it was kind of a family thing, which was cool. I still collaborate with my dad. When I have a renovation I’m working on, I’ll show him the floor plans and talk to him about things and get his perspective. I understand you studied interior design as well as psychology at ISU. Does psychology play a role in your career as an interior designer? It’s really just an interest of mine, but it has really contributed to my understanding of how a home represents who people are—it’s where they spend most of their time—and it helped me to understand the kind of comfort that needs to come with owning a home. You have to be able to grasp what people want to feel when they walk into their front door, or into their bedroom and you have to make that happen based on what they’re trying to explain to you. Sometimes a client lacks the confidence or knowledge to explain to you what they really want, so it’s my job to put those pieces together and make that connection, but those things don’t happen overnight. I have to read between the lines and connect with people. There are different reasons people want a well-furnished house; there’s always more to it and unlike picking out an outfit, the style of a home has to have more longevity. Learning what is important to people is what makes a successful designer. So what can a customer expect from you? The major difference between being an independent designer and working as a designer for Dwell, is that we keep things moving forward. I’m usually juggling 10-12 projects at any given time, which means I have to be confident in my own decisions. I have to be able to manage multiple projects and multiple clients in order to be successful here, so honesty is number one. I have to gain my clients’ trust. They have to know that I’m looking out for their best interests and that I want to achieve the goals we make together. If they’re really struggling to make a decision, it’s up to me to find something that works. I work hard to make sure that the clients know that I prioritize them, I prioritize what they want to achieve, and I prioritize how they see the space, regardless of the size of the project. My client will never feel as though their home or room is getting any less attention than a bigger project I’m working on simultaneously. They are all equally as important. Renovations. If we had specialists for every project, mine would be renovations. I love taking an old space and turning it into something new and fresh to suit the client. There’s the added challenge of keeping with the integrity of the house, tying in functionality and style and that is what makes it for me. If I could do that every day, I would love it. What is hot right now? How do you keep yourself fresh? I try to stay current by reading blogs and by following the work of other designers around the world, especially on Instagram. I’m also on the Dwell buying team and that really helps me follow trends because I get to see what the manufacturers putting out and that filters down. Trendiness is okay here and there, but a very “this-season” house gets tiring next spring. Do you have a pretty good idea of how long a new trend will last? I try to, but some people come to us and they just love what they love and at that point, it’s our job to make it work for them. In those kinds of situations, I like to take it on as a challenge and make sure that I still keeps the integrity of the home to the best of my ability. People come to us because they know they need a professional. We are the experts and we have to take some ownership. We have to remember that the clients come to us for a reason, so we make a point to stay up-to-date. You’ve talked about the relationship between the functionality and design of a home. What role does that play in your work? That is one of the first things I try to uncover. I have to know whether the space is intended to be really stylish or really comfortable, and even after that, it still always falls somewhere in the middle. Someone that wants to sit on something really stylish and contemporary still wants to be comfortable. People that come to Dwell are already quite design-minded and so it’s safe to assume a certain level of style, but every client is unique and it takes a while to find out where those priorities land for their home. What are some things you love about your career as an interior designer at Dwell? Number one is design. Number two is my clients. I really just love design; it’s that simple. I love great spaces and that would be true whether or not I worked at Dwell. When you’re in a comfortable space, everyone is happier. I am always thinking of design. I can’t shut it off, whether it’s my own space or my family’s spaces and I’m not the type of person to leave my work at my desk. I take my job with me everywhere. My little brother just bought a house and I’m so geeked out about it. That’s just who I am: design makes me tick. When it comes to the people, my clients and the relationships we create make my job so much fun. People are so different and interesting and I love bringing that out in their homes. Design isn’t their thing; it’s mine and so I like to think that designing a space for them is my contribution to their life. I get a creative outlet that turns into my gift to them. If they have a high-impact stressful job, they can come home to be comfortable and relax and enjoy where they are. Contact Krystal for a quote or to schedule a consult.